Dark, gothic, fantastic, and grotesque, these haunting stories are among the world’s most individual and finest. 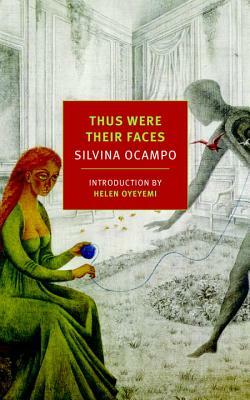 Silvina Ocampo (1903–1993) was born to an old and prosperous family in Buenos Aires, the youngest of six sisters. After studying painting with Giorgio de Chirico and Fernand Léger in Paris, she returned to her native city—she would live there for the rest of her life—and devoted herself to writing. Her eldest sister, Victoria, was the founder of the seminal modernist journal and publishing house Sur, which championed the work of Jorge Luis Borges and Adolfo Bioy Casares, and in 1940 Bioy Casares and Silvina Ocampo were married. The first of Ocampo’s seven collections of stories, Viaje olvidado (Forgotten Journey), appeared in 1937; the first of her seven volumes of poems, Enumeración de la patria (Enumeration of My Country) in 1942. She was also a prolific translator —of Dickinson, Poe, Melville, and Swedenborg—and wrote plays and tales for children. The writer and filmmaker Edgardo Cozarinsky once wrote, “For decades, Silvina Ocampo was the best kept secret of Argentine letters.” Silvina Ocampo: Selected Poems is published by NYRB/Poets. Daniel Balderston is Andrew W. Mellon Professor of Modern Languages at the University of Pittsburgh, where he chairs the Department of Hispanic Languages and Literatures and directs the Borges Center. He is currently completing his seventh book on Borges, titled How Borges Wrote. He has edited numerous books, including Voice-Overs: Translation and Latin American Literature, and has also translated books by José Bianco, Juan Carlos Onetti, Sylvia Molloy, and Ricardo Piglia. Helen Oyeyemi is the author of five novels, including White Is for Witching, which won a 2010 Somerset Maugham Award; Mr. Fox, which won a 2012 Hurston/Wright Legacy Award; and most recently Boy, Snow, Bird. In 2013, she was named one of Granta’s Best Young British Novelists. Jorge Luis Borges (1899–1986), a giant in Latin American letters, wrote numerous books of poetry, fiction, and essays, and was a prodigious translator of authors such as Kipling, Woolf, Faulkner, and Poe. He was a regular contributor to Victoria Ocampo’s journal Sur, and a frequent dinner guest of Silvina Ocampo and Bioy Casares. Over one of their legendary conversations, the three friends came upon the idea of editing the Antología de la Literatura Fantástica, which was published in 1940.